Yikes, I almost forgot to do the post, Ruth will be gunning for me - the first week I've posted for yonks and I'm back to my old slack self, so sorry Ruthie!!! haha! I'm still out of synch after the clocks going back last weekend and for some reason all day I've been thinking it was Wednesday. Still, remembered last minute (actually gave my tongue freezer burn off my Cornetto because of the shock) so all is not lost! I'm in Halloween mode and have been carving my mini pumpkin today but it looks a bit forlorn all by itself, so am on a quest to get a bigger more impressive beast tomorrow! oooerrr Mrs!! LOL! I made some Toffee Apples the other day - they were SOOO scrumptious - at least if we'd been able to eat them they would have been!! Unforch I didn't quite cook the toffee long enough and although it did harden it didn't get to that break-off crispy brittleness so all that happened was my teef literally got stuck together!! I thought I was gonna die from toffee asphyxiation! Honestly! I had a bunged up nose and I couldnt breathe through my mouth my molars were welded that tight!!! And we are both in need of a dentist at the moment so I didn't even let the other half near them! If I could've bared my teeth long enough to laugh I would've believe me, and I only had a piece about an inch big. I was gutted cos I'd used all the apples and was really lookign forward to them, hahahaha. They did taste lush I have to say! I daren't give it another go now though having wasted 8 apples and a whole pound of sugar! hmm maybe I should've taken them to the post office picket lines - one of those babies would soon send them all off to the dentist for a few hours and long enough for our post to get through - maybe I will send the recipe to the Postmaster General! So talking of Halloween, last week we challenged you all to make Halloween stuff and those of you who posted haven't let us down with your awesome creations, but you can still enter up to lunchtime on Sunday so if you've made any great Halloweeny stuff for the day itself you still have time to enter. Well done girls, please email me for your lovely Downloads! Right, onto the task at hand. Last week we knew every challenge blog in the world must have done Halloween, but PLEASE!! Some of you are entering 32 or more challenges with ONE card!! I MEAN?? Whassat all about???!!! 32!!!! I think someone even had 35, good on you for keeping track and actually typing them all out, personally I would have lost the will to live! 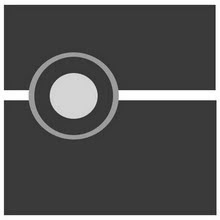 So as some of you are obviously finding it hard to keep to the rules, we have decided to increase the number of challenges you can enter up to 10. Ok, for the next challenge I'm going to ask you to make a MALE project! Oh no I hear you all cry! Oh yes! I LOVE doing men's stuff, maybe because green and blue are 2 of my fave colours. As a tip for anyone who does struggle with stuff for guys - they always like strong colours! 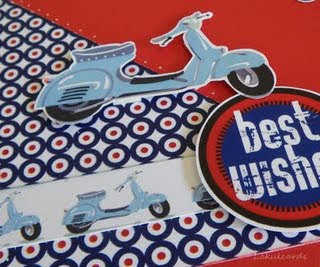 And don't feel you HAVE to put a fancy embellishment on, quite often a good man's card is really plain and simple. So you need to make a MALE project and you have to use 3 brads. That's it! It can be anything and you can use anything you like! Easy! You have until Sunday 8th November at lunchtime (GMT) to enter so get your thinking caps on! The Winner of this challenge will receive a free Candy Doodles CD worth £14.99 so come on - get entering now! So as the saying goes, that's it Folks! another week over and another challenge for you to get your teeth into - that's if you have any teeth left after all that trick or treating! Don't forget there's a free CD on offer for the winner!! Week 23 Challenge - Halloween! Be prepared for some spooky offerings from the Design Team this week! It is Friday once again and because Nikky is relaxing in the Green Room at Ideal World and rubbing shoulders with the crafting stars of the telly, I'm back again to write the challenge post for the week! And we are already upto week 23! Which means, if my maths is any good that the Polkadoodle Design Team and Challenge Blog are slowly approaching the magical 6 months mark. And the little whisper I heard on the grapevine is that there will be some fab blog candy available very soon to tempt you into entering our challenges. So you have to be in it to win it!! 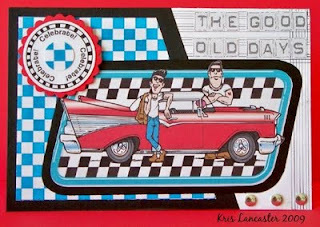 As I mentioned before, Nikky is on the telly this morning - 10am GMT on Create and Craft / Ideal World - Sky channel 671 showing her latest double cd - Not For Girls. So tune in and take the weight off your crafting toes for an hour - you'll be glad you did! Congratulations ladies! Please email Nikky for further details and your lovely blinkies! So this week, the DT have been set the challenge of Halloween. Now this may fill you with dread (no pun intended!) but you don't need to make a card - just look at some of the creations from the DT - food can be spooky too!! You can use any items you wish but all the better if they are Polkadoodle's! All the DT have worked with the Halloween Download which is available here and has 35% off until 31st October - what are you waiting for??! I just love the grotty papers!! Please remember that you can combine your Polkadoodle entry with three other challenges - making a total of 4 for one item. 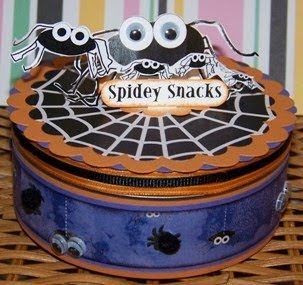 Yes spiders do have snack tins and here is one made by Boni to prove it! Just look at the googly eyes on those spiders! A shrink plastic Polly sits on top of this sweetie jar made by Claire - the pumpkins around the bottom of the jar are also from the Halloween download. You just cannot beat googly eyes - Enfys has livened up Jack in his ghostie costume with some larger than life eyes! 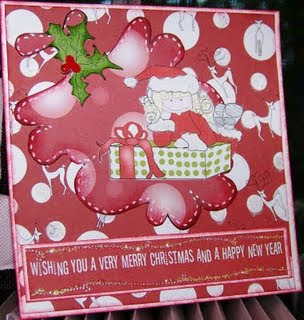 I love the drippy effect on the card and the freehand stitching! Kerry has created a spooky free hanging spiders web and just look at the size of the critter in the centre! And googly eyes too! It's looking like ghosty Jack is very popular with the DT this week! 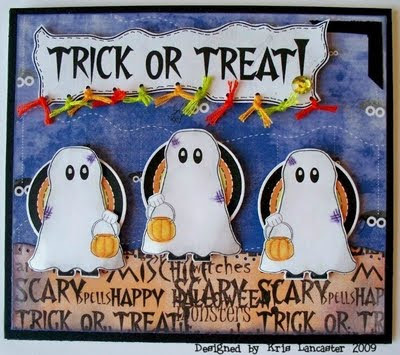 The ghosties have been layered onto one of the sentiments by Kris to create a spooky backing. 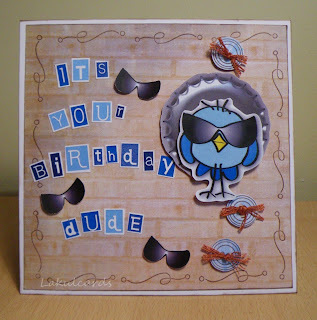 The little twists of cord just add the right amount of colour to the card. Lou has cleverly used the Candy Doodles stamps to create some quite spooky trees! They've been stamped onto the Halloween papers and then trimmed. Now there is no point in asking how many chocolates are left as the answer is none - my youngest has scoffed them all! Paper, sentiment and dressed up Jack all from the download - the bats are table confetti. 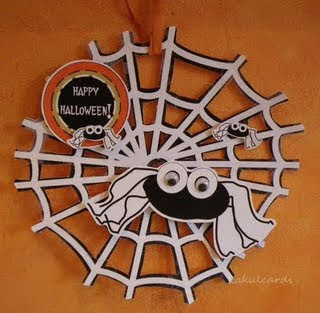 Saskia has used a lot of the elements from the Halloween download to create her spiders web card. Spooky!! You have until 12noon GMT on Sunday 1 November to enter this challenge and challenge 22 is still open until Sunday 25 October at 12noon GMT. Well I finally managed to relieve Ruth from bloggy doo-tays for this week at least, bless her for helping out so much lately, I really don't know what I would do without ALL my lovely designer gals, they are absolute treasures. I just never seem to have a minute these days between designing and travelling to Create and Craft, the weeks are flashing by and I can't believe it's the middle of October already, this has been a whirlwind year for sure. This month we've launched a new double CD "Not for GIrls" which has gone down a storm and kept us extremely busy shipping and packing, we have literally sent the last batch of the pre-orders off today, it takes us over a week to plough through them all. So after all the craziness my mojo seems to have got up and bogged off , maybe I'm just tired out - eekk what if it doesnt come back!?! Horror! I couldn't live without making something for more than a couple of days though - could you?? Stranded on a desert island I would be the one trying to draw with a stick and making a raft using all the twirliest twigs and the prettiest leaves, with a sail made from flowers and a trail of lotus petals following us home!! Seriously! Not to mench having first built a deep hole and trying to melt sand to make glass so I could sip my cocktails!...right, quick slap round the chops and it's back to the reality and drudgery! Talking of drudgery I actually CLEANED, slap, whack, ouch, yes I did THAT word to the house this week! Necessity of course, we had a plumber coming and it involved moving lots of boxes of stash from where he wanted to be and the shame of the cat fluff just caught up with me quite honestly. Still it's over now, won't have to do it again till Crimbo, hahaha! No we have vowed to try and do IT once a week at least from now on. hmmm, WHATeva! we do try and leave comments although sometimes time does prevent but it doesnt mean we don't see them because we do! and big congratulations to Shirley who snaffled the Winners Accolade this week! Well done to all 3 of you, please email me for your blinkies and goodies. open until lunchtime on Sunday so make sure you get your entries in! 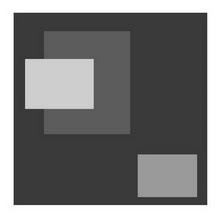 ...we have another sketch this week so please follow the sketch - you can rotate it or flip it, as long as the sketch is recognisable. Also, please remember that you can only combine your Polkadoodles card with 3 other challenges - the limit is 4 including Polkadoodles. 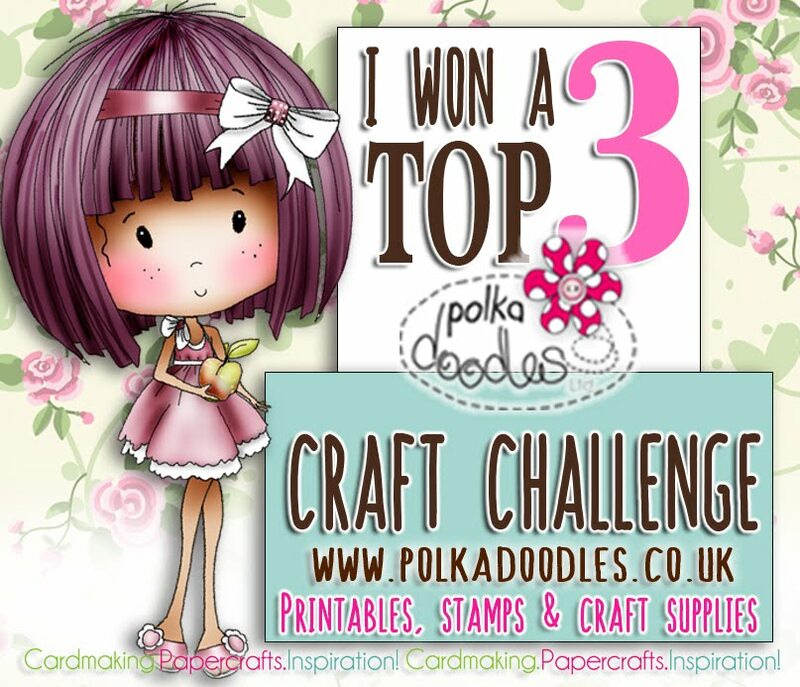 Follow these little rules and you could be in with a chance of winning some fab Polkadoodles products! As we're coming up to Halloween the Top 3 entries will each receive the Polly Polkadoodles Halloween Download Bundle as a little prize for their troubles. Closing date for your entries is Sunday 25th Oct at noon GMT. As it's close to Halloween we'll vote for our winners early so you can get your prizes in time to be making Halloween-y stuff! So come on, get cracking! Good morning! It's Friday again so that means another Polkadoodle Challenge! Congratulations to you all! Please email Nikky for your blinkies and the lucky winner gets a Polkadoodle prize! Challenge 20 from last week is still open until Sunday 11 October at 12noon GMT so you still have time to enter! Right, onto this weeks challenge! 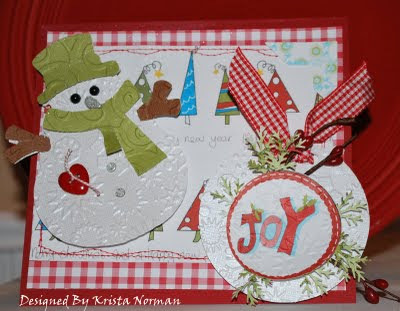 Nikky gave the Design Team this following sketch and asked us to use Jingle Jangle Christmas and also the rubber stamps. To enter this challenge, please follow the sketch - you can rotate it or flip it, as long as the sketch is recognisable then that is fine. Also, please remember that you can only combine your Polkadoodle card with 3 other challenges - the limit is 4 including Polkadoodle. 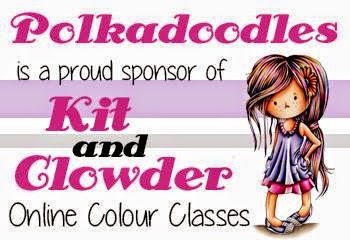 Follow these little rules and you could be in with a chance of winning some fab Polkadoodle products! 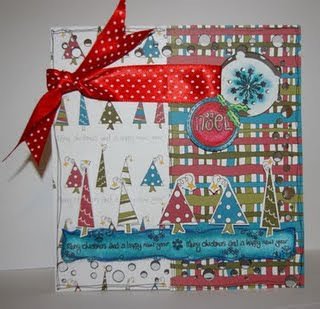 From the Design Team creations, you'll be able to see just how versatile Jingle Jangle Christmas and the stamps are! If you want more details on how each card was made, just click on their names! 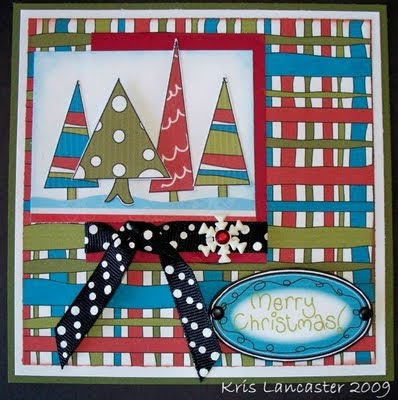 However, Nikky forgot to use Jingle Jangle Christmas and she has used the Crimbley Doodles download instead! I do forgive her, purely for the use of that wonderful red spotty ribbon! 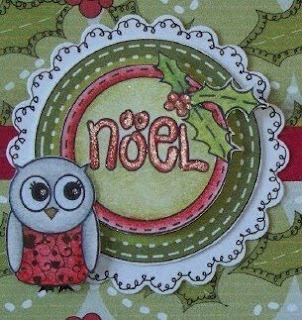 Boni has created a wonderfully festive Christmas card! And Polly looks so sweet leaning on her rather large Christmas present! Now this reminds me of Iced Gems. And I'm not showing my age here as I know you can still buy them in the shops! 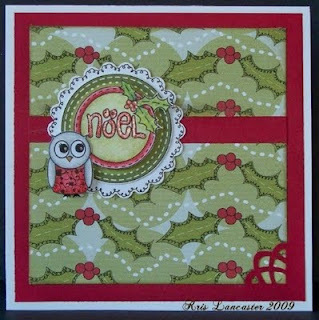 Claire has added some fab doodling along with images from Jingle Jangle Christmas and some of the rubber stamp images. Ah - Christmas greens and reds! Enfys has created a wonderful traditional coloured Christmas card complete with real stitching! Now that just completes it for me! Now this from Kath just screams Christmas at me!! 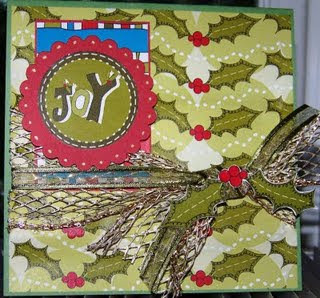 The little snowflakes are from the Christmas stamp set along with the holly and berries. And yes, Christmas screams. Or at least it does in my house!! A fun card from Kerry - those fairy lights look so real and does the candy lolly make you feel peckish too?! Just look at this cute penguin family! This really is Saskia and her family! A funky felt flower (try saying that fast!) has been added to her card - everything else is from the cd! Now I do like Polly. She really should be scattering some stars but I had an accident with the scissors and instead she is holding a stamped and glittered gift! 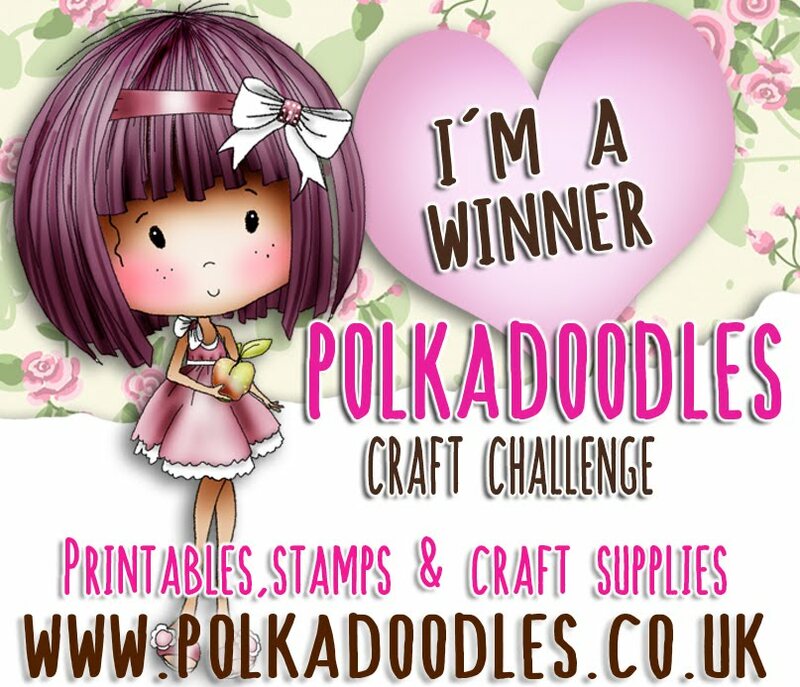 To enter this challenge, please leave a comment with your blog post as the link - you have until Sunday 18 October at 12noon GMT to enter and you can use what ever papers you like - better still, if you have any Polkadoodle products, we would love to see them! We don't have many rules but we do ask that you follow the challenge for that particular week and also please remember that although you can combine this challenge with others, the limit is 4 including the Polkadoodle challenge - any more will be disqualified. Good luck and we can't wait to see what you create! It's Friday again! And I bet you thought you'd seen the back of me - but here I am again like a bad penny! 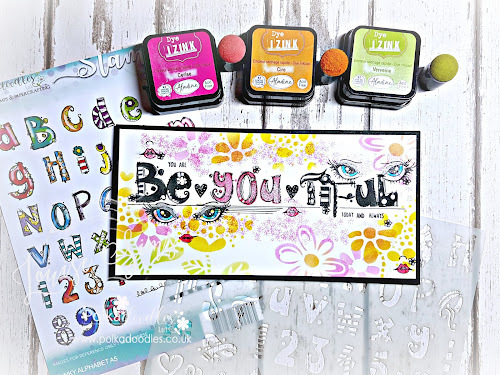 Nikky asked me to step in this week to write the challenge post as she will be busy creating and demonstrating under hot studio lights at Create and Craft this morning, so I couldn't really refuse could I?! Nikky will be demonstrating her latest cd as an exclusive on Create and Craft at 11am - the new cd is a double (but not double the price!) and has over 1,500 printable elements. It is called - Not For Girls - yeah a men's cd!! 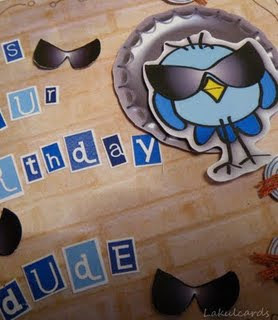 There is lots and lots of different themes on the cd's and will suit all male ages - it's a one stop shop cd!! 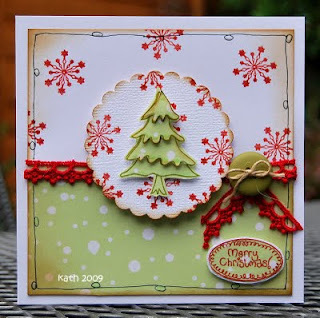 Nikky asked all the DT to follow the sketch and also to use the Christmas download Crimbley Doodles so you'll be able to see just how versatile the papers and elements are! 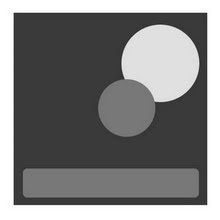 You can rotate it, flip it just as long as we can recognise the sketch then you are good to go! 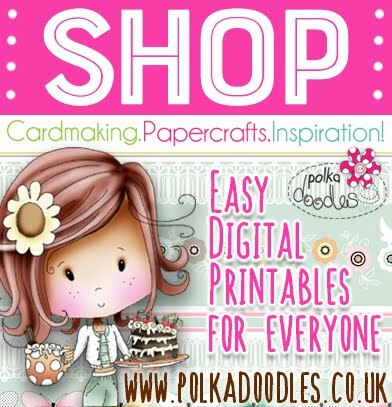 You can also use any papers and elements that you want - we would like you to use Polkadoodle products but if you haven't got any then that is fine. In fact, you could win some! 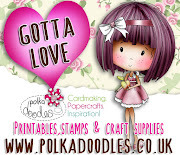 If your entry is picked as the winner then you win something lovely from the Polkadoodle range! This challenge is open until Sunday 11 October at noon GMT and last weeks challenge is still open until this Sunday - 4 October at noon GMT so you still have time to enter challenge 19! But before I show you the Design Team samples, I need to announce the winners from Challenge 18 - DIY Flowers! Congratulations! Please contact Nikky for further details and your blinkies! And now onto the DT samples! All the DT cards were made using the Crimbley Doodles Christmas download with a few extra additions from their stash here and there. If you need more details on how each DT member made their creation, simply click on their name and you will be whisked there! Boni has added some silver mesh to the front of her card and it is fastened with a sprig of holly cut from the backing papers. 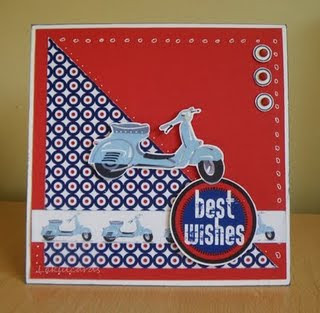 Now this is not actually a card - Claire has made a gift box and followed the sketch on the lid - how clever! More shots of the box are on her blog. 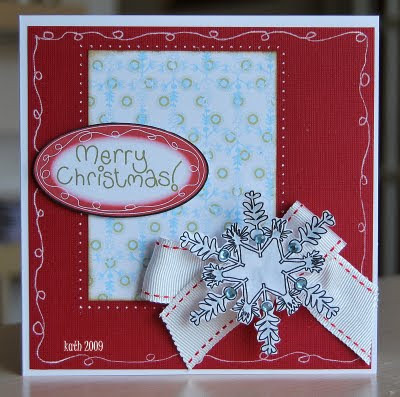 I do like the scalloped cards and in icy blue too! This card is from Enfys - great tree! The blue and reds work so well together. 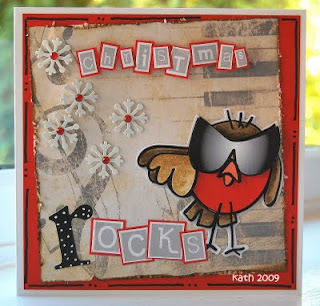 Kath has layered elements onto a lush red background and added some doodling. 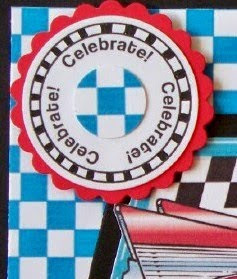 I do like chunky ribbon! 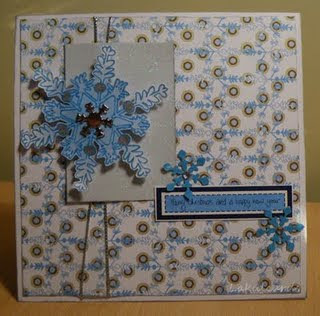 Kerry has opted for an icy blue Christmas - the snowflake used on both this card and Kath's are stampies from the download collection. These are such funky Christmas trees! Kris has cut the trees out individually and layered them using silicone glue. 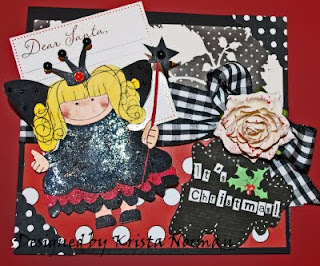 Now this is a fun and funk Christmas card from Krista! 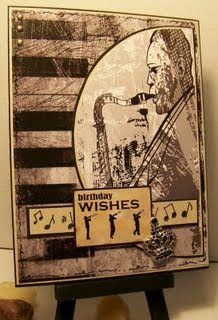 I like how all the layers are made up - overlapping and extending off the card. Lou has also gone for a frosty winter theme and has made her own snowflakes with more delicate snowflakes and buttons layered over the top. Saskia has added some funky fibres to her creation. I do like the little trees peeking from under the sentiment! 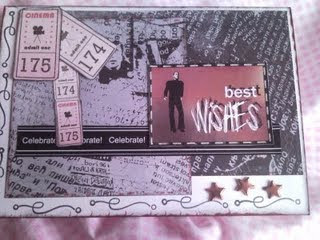 And finally, my card. I've used acetate as my base and cut out elements from the download and added them on - quite simple but a pain to photograph! Hope you are inspired to join in this week - you can use any papers or embellishments you like as long as you follow the sketch. Please link to your creation rather than your blog as this makes it a lot easier for the DT to find your entry!